The Fuji LM-1 Nikko is a Japanese light communications aircraft of the 1950s. 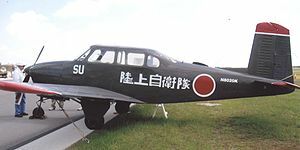 Fuji Heavy Industries built 176 Beech T-34 Mentor two-seat training aircraft under licence in the early 1950s. Fuji redesigned the basic Mentor as a four-seat communications aircraft under the designation LM-1. A new lengthened centre fuselage was added to the Mentor's wing, undercarriage and tail assembly. 27 LM-1s were produced during 1955/56. The LM-1s were delivered to the Japanese Air Self-Defense Force (JASDF) and were used for communications and general duties. After withdrawal from operation, several LM-1s were sold on the U.S. civil market and are flown by civil pilots as "warbirds". Green, William (1956). The Aircraft of the World. Macdonald & Coi (Publishers) Ltd. ISBN none.